God's Natural Gifts – Reaching out to others through God's Natural Gifts. How about a SHOT of Ningxia?? What makes Ningxia Red so special? Why is it any better than all of the other health and wellness drinks I’ve tried before? Why is an essential oil company carrying a wellness drink.. aren’t their oils enough?? I am SO glad you asked! Let me just tell you, Ningxia Red is a pretty big deal to us oily people! Answer to question number 1: Ningxia red is special for many reasons. Ningxia Red is an all natural, delicious, nutrient-infused wolfberry drink. It contains the Ningxia Wolfberry. The wolfberry is found in the Ningxia providence of Northern China. The residents there have used this berry for many years to support their bodies. Dr. Chao, a Chinese scientist, told Dr. Gary Young that the people who regularly ingested this berry led remarkably long and healthy lives. Not many people knew about the power in this super fruit until recently. Chinese biochemists have analyzed the wolberry and found that it is one of the most nutrient-dense foods ON THE PLANET! It has HUGE amounts of fiber and also contains compounds that maintain healthy vision. Young Living purees the entire fruit so that you get the greatest benefit of the wolfberry. Answer to question number 2: This answer is simple! Ningxia Red is better because it doesn’t ONLY contain the wolfberry super fruit. It contains a fruit juice blend of grape seed extract, blueberry, plum, aronia, cherry and pomegranate. These fruit extracts are a great source of amino acids, support the cardiovascular system, contain powerful antioxidants that protect the body from a myriad of health risks, and helps maintain healthy bodily functions. Here is the real kicker that NO OTHER DRINK CAN BEAT… Our health and wellness drink is infused with PURE, THERAPEUTIC GRADE ESSENTIAL OILS!!!! It contains Orange, Yuzu, Tangerine, and Lemon essential oils. Tangerine essential oil is great for maintaining cholesterol levels that are within normal range and has an amazing citrus flavor. Lemon and Orange essential oils contain the powerful antioxidant D-limonene (read up on all this beauty can do). I’d like to consider these two oils my “happy oils”. Yuzu essential oil has a great exotic flavor and has beneficial antioxidant content. The mix of adding essential oils to this super fruit drink provides great benefit to many systems in your body, including: the immune system, normal brain functioning, normal digestive health, cardiovascular support and MUCH MORE! Answer to question number 3: Our oils are absolutely amazing and our family has grown to depend on YLEO’s in all areas of our daily life. So, to answer this question, Young Living essential oils can definitely benefit your family in MANY MANY ways. But, Young Living is not only an essential oils company… It is a HEALTH AND WELLNESS company. Our vision is to help your family find Wellness, Purpose and Abundance. Gary Young, the founder of Young Living is a SEEKER! He will go to far lengths and to places that other men would dare venture to find nature’s sources of wellness. Which is how he discovered our beloved wolfberry. We have a “steadfast commitment to essential oil purity, we’ve inspired millions of people everywhere to experience nature’s gifts of wellness, to create abundance as Young Living members, and to discover new opportunities for lifelong transformations.” – Young Living* Long story short, we are a company who cares for you and your family. We want to give you the BEST of the BEST–because that’s what you deserve! I hope this helps give you the information you need, to be ready to transform your health naturally! We know that before God created man, he first created the plants that can provide healing for our families. We are created in the image of the Lord. Our body’s are a temple. Let’s protect that temple so that we can share the love of Christ the way that he intended. We are starting a NINGXIA RED CHALLENGE in the month of September 2016. We will be committing ourselves to ingest at least a 2 ounce shot of Ningxia Red a day for 30 DAYS. I can’t wait to see how many of you come out with amazing testimonies to how much better you feel!!! To learn how to receive Ningxia at the Best price, please contact me (remember to ask about my new member coupons). I have included a few member testimonies below. We love our Ningxia Red and we know that this secret is JUST TO GOOD TO KEEP!!! I have used Ningxia Red about a year. It helps my a1c. Plus, it helps with energy. Both my husband and I drink it. When I first began using Young Living Essential oils and products, the first thing I wanted to order was NingXia Red. Everything I read about it sounded so amazing! I love the energy it gives me, the support my immune system receives, not to mention that I haven’t been sick but once since March of 2014 and that says a lot! I have always had problems with my digestive system and that has been resolved. (Thank goodness, can you say regular) I make sure I get at least one ounce a day, sometimes two. If I was told I had to go and live on an island for a year and I could take only a few things, NingXia Red would be among those items. Some say, I can’t tell any difference, I say miss a day of Red and you will for sure notice the difference! As much as I love My Essential Oils and their wonderful benefits, NingXia Red is by far my favorite! I’ve been using Ningxia Red for almost 2 years. I believe the Ningxia Red helps to boost my energy and helps to support my immune system. Like Lucy says, “It’s so TASTY TOO!” I like it good and cold! I take one ounce of Ningxia Red a day. It makes me feel SO energized. I have had the same eye prescription in my contacts for years and years. This year at my 6 month routine check up, the doctor had to LOWER my prescription. My Doctor was amazed. This is my favorite Young Living product! I am a person that has one mode, and that is GO. I don’t like to sit idle. I have to constantly be doing something. Jonathan often laughs at me when he asks me to sit on the couch with him and watch television. Because either my hands are twisting, legs are bouncing or something is fidgeting. Even if I find myself still, my mind is still running wide open. This type of lifestyle in itself is enough to exhaust most people. But, it’s just who I am. Since I was blessed with this type of personality I usually get ready for a break from reality. I start brainstorming where we can go to get away. My number one spot to go is the Mountains of East Tennessee. The “Smoky’s” are where I always went as a child with my parents and siblings. It was our spot! I guess the love I felt there as a child just stuck with me. Anyone who knows me personally knows I call it my “happy place”. We are now headed home from a great little getaway. I needed it! Or so I thought…. I’m not going to bore you with very step of our vacation. This post was more to tell you what I learned while I was away from my so called, reality. I like to wear this essential oil in my diffuser necklace called, Magnify Your Purpose. It’s one of my most favorite daily essential oils to wear. I had it on as I walked out on my balcony on Wednesday morning. I smelled it as soon as the air hit me. At that moment, While taking in the view, the Lord spoke to me in what might as well have been audible voice. He so clearly said “why can’t you rest in me?” Although I love to vacation and could SERIOUSLY be a professional vacationer (if there is such a thing), I didn’t “need” it. I needed to rest in him, take TIME to be still, and take time to renew my strength in him. He is ALL we need. He shouldn’t be just a getaway but a place to take refuge daily. He blessed me over a year ago by showing me the purpose he has for me. Knowing your purpose is a blessing in itself. Knowing his will doesn’t mean you’ll never get off track. Nor should it by any means tell you that you have it all figured out! You need the Lord. I thought I loved my “Magnify Your Purpose” essential oil before but now, WOW. When i smell this aroma, it reminds me that I should rest in Him. I should continuously rely on his word. It reminds me of my view of those mountains. And that i don’t necessarily need the Mountain.. I need the maker of every mountain. I need The ROCK. For it is in Him where the Greatest rest can be found! 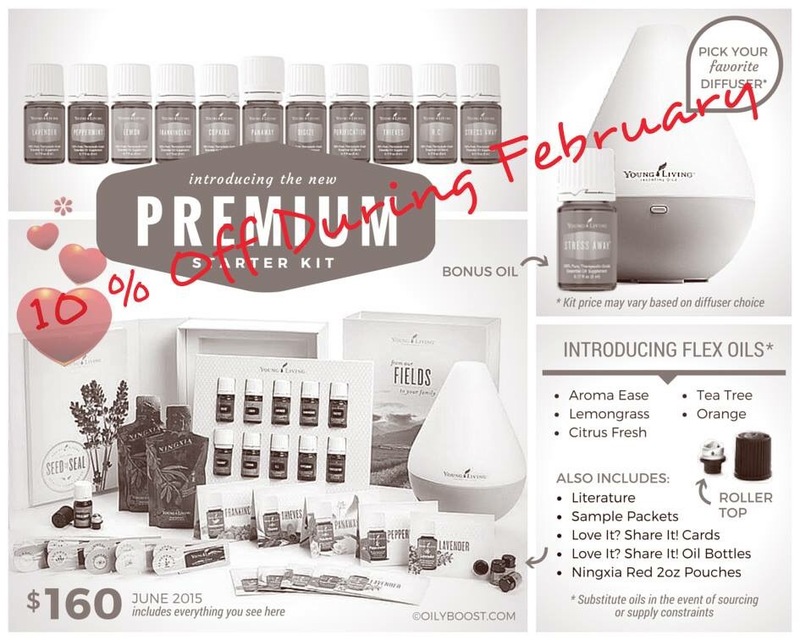 Young Living’s most amazing kits ever are on sale THIS MONTH ONLY!!!!! Throughout the month of February you can purchase ANY Premium Starter Kit at 10% off!!!!! They have put much thought into all of their kits to help get you just what you need to get started towards a more healthy version of YOU. I have descriptions of each kit in the Become A Member section. Along with the purchase of your kit from Young Living, you will receive a Welcome Packet from me with loads of information and a booklet to help get you started, you’ll be able to take part in a Private Facebook Group EXCLUSIVE to our members, you’ll receive a FREE educational class from me to help you get started using your products and TONS of one on one personal attention! I can’t wait to hear personal testimonies from all of you of how Young Living Essential Oils are changing your life. I know that my life is much more fulfilled since I’ve become a member of Young Living. Feel free to contact me with any questions you may have.